While we gear up for our big bake sale on November 30, we’ll need your help getting the word out. We need to recruit enough bakers, shoppers, and volunteers to make this sale better than ever. Your mission, if you choose to accept it, is to shout “Austin Bakes” from the tree tops. We’ve created some tools to make that a whole lot easier. Enjoy! Use this graphic as your Facebook cover. Add this graphic to your blog’s sidebar, or feature it in a blog post. Re-pin this pin on Pinterest. Invite your friends to the bake sale through Facebook. Write a blog post, article or letter to the editor promoting Austin Bakes for Austin. Check out our latest press release for details. P.S. 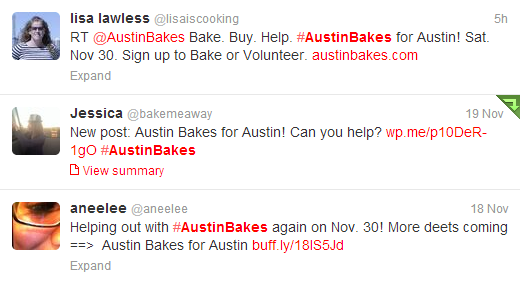 If you blog about Austin Bakes, please let us know! We’d love to share a link to your post here on our site! You can check out past blog posts, articles, and more on our press page. This entry was posted in Austin Bakes for Austin, Blog, News about the sale, Past Sales and tagged Austin Bakes, Austin Bakes for Austin, Austin Disaster Relief Network, Austin Flood Relief by Mary Helen Leonard. Bookmark the permalink.